Action Water Sportz is a one-stop for renting pontoon boats. We have the best pontoon boat rentals in Myrtle Beach. We are a one-stop solution for all your beach related renting needs. We strive to make your boating experience the best. Our pontoon boats are Yahama 4 stroke outboard engine equipped, which allows noise free and smooth boating experience. We keep our boats hygienically clean, our boats are thoroughly cleaned and washed after every rental, so you need not worry about the cleanliness of the boats. Life-saving options like lifesaving vests, tubes, and other equipment are provided for every emergency when you rent the boat. 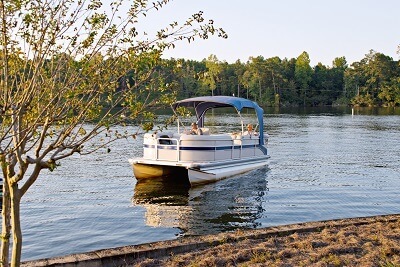 Our pontoon boat rentals are designed to handle around 10 persons or 1410 lbs of weight. The best thing about us is that you can try boat you want to rent and then rent. We provide our customers with the best pontoon boat rentals Myrtle Beach at affordable prices so that the boating does not dig a hole in your pockets. What is the time limitation for pontoon rented boats? We have three rental times. Morning half day, evening half day and full day renting options are available. The evening half day timings are 1:00 PM to 5:00 PM. Need even more time on the boat? Why not opt our full day renting option, the timings for full day pontoon boat renting is 8:30 AM to 5:30 PM. So it is completely up to you what time you want to rent the boat for. We do not have a long list of requirements. A valid credit card and a photo identity is all you need in order to rent a pontoon boat with us. We love to keep it simple. No boat will be rented for night cruises. Operation of rentals is strictly prohibited in the ocean. Operation of rental boats is permissible only in the Intracoastal Waterway and adjoining navigable waters. Any operation of rental boats in the non-permissible or prohibited areas can damage the boat. Damages incurred during this time is paid for by the renter. So enjoy a day in our pontoon boat rentals with family, friends or colleagues. We strive towards giving our customers a never before and never after boating experience. We offer the best Pontoon boat rentals in Myrtle Beach at very affordable prices. Our prices and rentals are the best in the market. Why book with anyone else when you can book your rentals with thirty-two years of trusted boat renters, So book your pontoon boats with us now.